The second part of the VSGMR rules has been complete for more than six months now, and it features nine different sets of rules that add to the basic rules set, plus a few examples of different game styles. Many of them are inspired by existing, professionally published rules sets. They add a little more complexity, but not too much. Here’s what inspired each part of the rules. When I revisited VSGMR, it was in the face of dozens of miniatures games, from the giants of Warhammer 40,000 and Warmachine to even brand-new ones like Star Wars Legion. I’m not trying to compete with those games — to start with, I don’t have the capability to produce my own miniatures — but what I don’t have in art I have in flexibility. VSGMR is designed to be used by any figures you own, and with a minimum of complexity. The basic rules require only one d6. So the goal of the expanded rules are to recreate the options found in those other games… while at the same time keeping the game fast-moving and still “realistic,” as realistic as you can be in a game with monsters and superheroes. This keeps the action moving for both players, instead of having one player wait until the other player is all done. It’s also more realistic, as the combatants would be moving and attacking individually, not just when their entire battle group acts. Someone who has a good shot will take it as soon as a target moves into view. This is a simple rules revision that speeds up bigger games immensely. It seems easy to manipulate, with figures slipping past their alloted movement amount by a little bit each turn. The rule that no “support” figure can go past the unit’s leader keeps that under control. And since a lot of the “support” figures are there to make one or two attacks before they’re defeated, there’s no need to keep track of the movement for individuals; they’re not alive long enough. The simple option of having specific skills brings what are otherwise collections of weapons and hit points to life. Well, in VSGMR, each figure only has one hit point, but the concept remains the same. VSGMR is ideal for skirmish-size combat, just a handful of figures in each army. That’s the perfect size for a team who each have a unique skill (one’s the leader, one’s the demolition expert, one’s the thief, and so on). This option turns the game into more of an RPG, and to take full advantage of it players will need to come up with scenarios that call for dice rolls using the figures’ skills. We’ll explore some examples in a future blog post. I rarely buy games that can’t be played solo these days; it’s fun to get a group together, or even just a gaming partner, but with schedules and families and life in general, it’s really challenging to make it work. There’s solo rules for many games available online, even games not designed that way, but solo rules need to be simple, and not change the requirements of the game (not add a bunch of extra components, for example). If the solo version is so much more complicated than the original game, the amount of play time you get by being able to play by yourself is cancelled out by the amount of time spent trying to set up or understand the solo rules. So, the ideal solo rules are tweaked from the original rules, while still offering the challenge and variety you can normally only get from a human (or well-written AI) opponent. This is what makes VSGMR a game like no other, that and the very simple single d6 combat resolution system. I don’t own a lot of action figures; as a kid, I did because I played with them, but as an adult, they would just sit on a shelf. What’s the point? That’s why there’s rules for figures of that size in the game, so you can play with that collection of figures. It’s also a cost-saving measure; if you can buy an entire Lego-sized army for a few dollars but all your opponent has is classic D&D miniatures, why let the different in scale keep you from playing against one another? I tried to include every figure size I could think of in the rules, and some of the example brands mentioned on the page have already disappeared in the few years since the original version of the game and this newer edition. But again, the concept is sound, and putting any figures you have into VSGMR battles is one of its most interesting drawing points. We’ll take a look at the other rules options and the motivation behind them next time. But if you’re like me, and you want to use all the miniatures and maps and terrain and stuff you use in other games and have spend years collecting — and at the same time you want to play USR — you need another option. So I’m borrowing from my own Microlite 20 rules for USR miniatures rules. 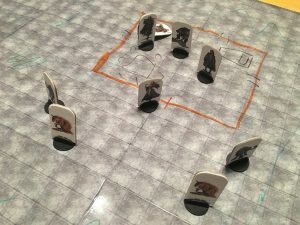 A recent game – elves and humans vs wolves and rats standing in for wolves. 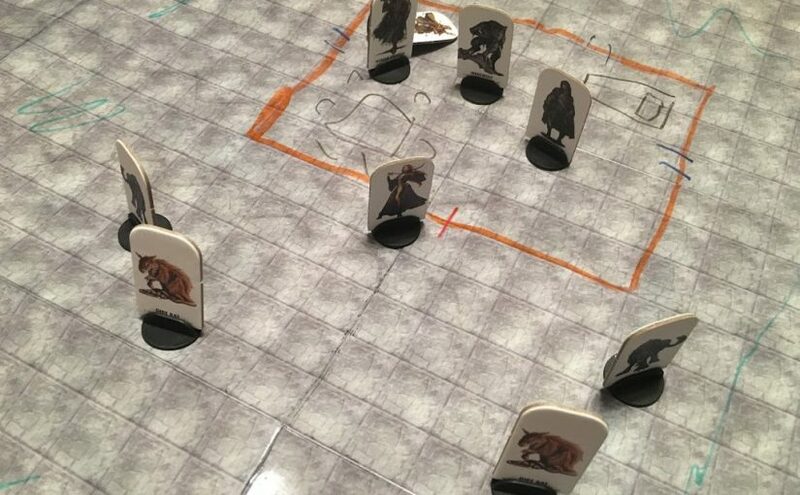 If you have miniature figures (about 1 inch or 25 to 28 mm tall) to represent the characters and their enemies, you’ll need a ruler or a battle map covered in spaces (squares, hexes or 1 inch measurements). One space equals 5 feet or 2 yards, and the average human-sized character and monster moves 6 spaces per turn, even diagonally. This is the character’s movement rate. Small characters (like halflings or gnomes) move 5 spaces per turn, while characters wearing heavy armor (splint mail, banded mail, half-plate, full plate) move 1 space less each turn. On older-style (i.e. OSR) maps, where one space equals 10 feet, the average character moves 3 spaces per turn. Characters can move through the same space as another character or enemy, but cannot end movement in the same space as another figure. Rubble, darkness, heavy growth and other difficult terrain “costs” 2 spaces of movement per space moved by the character. Moving up and down is the same as moving horizontally (a character does not have to “spend” extra movement to climb or fly). Moving just 1 space is considered a “free” action, as long as the character does not move any farther that turn. If there’s a question whether a character could see an enemy to hit it, draw an imaginary straight line from the center of the attacker’s space to the center of the target’s space (or one of its spaces, if it takes up more than one space on the map). If there is no major obstacle or enemy in the path, the character can make the attack. Allies of the attacker do not block its path. Characters can attack through windows and other partial obstacles at a -1 penalty to hit. To avoid calculating attack ranges each turn, melee attacks must be made against an enemy in a space adjacent to the character. Thrown and short-range weapon attacks can be made against an enemy up to 10 spaces away. Long-range weapon attacks can be made against an enemy up to 25 spaces away. There you have it, simple rules for miniatures. 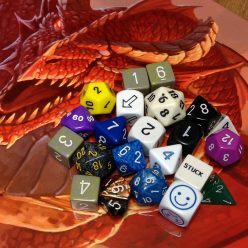 I’ve used them in several games I’ve written over the years, and they seem to be a good starting point. A character with a high Action stat or Specialisms related to agility and dexterity might move a space faster, and the difficult terrain and obstacles rules could get much, much more detailed (Action rolls to move through terrain? 1/4 cover?). Do miniatures play a part in your USR games?